Someone compliments something you’re wearing and part of your ‘thank you’ is the story behind the garment, right? “Thank you! I got this at a concert in 2007”, “Thank you! It was my grandfather’s”, “Thank you! Funny story actually….”. Doesn’t everyone do this? We’ve given a lot of thought to what makes us different from any other dry goods company and as we move forward in growing this brand, there are a couple of things we want you to know. First and foremost, we will deliver well made, often handcrafted, detail oriented products. We will serve the greater good and be a unifying agent. Since our company is named after the bowline knot, which is often referred to as “king of the knots”, we thought it would be perfectly appropriate to employ an intentional concept to tie people and eras together through stories. The bowline knot is described as a simple and elegant configuration; it never slips or comes loose under any strain or load. This serves as a model for our standard of excellence. There is also symbolism of the notion that if we meet one another in the middle, accept our differences and learn from each other, we strengthen the knot of humanity. We know that you can shop anywhere and so we want to deliver more than just a product, but also, an experience. With all of this in mind we want to explain the details of our latest release, the Bowline Co. x Ebbets Field Flannels (EFF) vintage ballcap collaboration. Kel and I designed the ballcaps, from the vector files for the obvious front felt components and wool broadcloth panel color, down to the nitty gritty details like contrast stitching, eyelet colors, seam tape style, etc. Then we worked with EFF to produce the first small batch of BCo. x EFF ballcaps. We’d love for you to read more about the collaboration. There are two designs and two colors for a total of four options. Some are fitted and some have a leather strapback. The ballcaps are for anyone with a dome; the ballcaps are for everyone. Inclusion will always remain one of our core pillars. While we’ve been waiting for the final product to arrive, we started collecting stories from anyone who was willing to write one. We believe everyone has something important and meaningful to say, and we want to read it and help share it. What happens next is beautiful. When someone orders one of our vintage ballcaps, they will receive one of the stories you all have submitted. Since most stories are accompanied by the author’s Instagram handle, you’ll be able to connect with them if something in their story grabs your attention. Our story-collecting effort is, and will remain, ongoing. Share a story with us, hell, share 33! We want to hear from you. And we want to hear from the people you know, so pass this along. As our archive becomes more substantial, we will begin accompanying more and more products with your stories. For now, it’s just the ballcaps. The navy designs are in-hand and the gray designs are a couple weeks away from delivery. All are available to order now. Dr. Seuss said “You can’t dribble on bow ties.” Definitely not the reason we got into the bow tie business, but … excellent point. It’s been almost five months since we took over Bowline Co. and jeepers creepers, we’ve been “right out straight”! For those of you not familiar with Maine sayings let me give you the Urban Dictionary’s take on it. right out straight: Very busy. This term is used frequently and vigorously by residents of Maine, as observed by comedian Bob Marley, "I've been right out straight tryin' to get the driveway cleahed since the blizzahd hit" (no, those aren’t typos). So, let’s fill you in on all the excitement! We’ll keep it brief because we know you’re probably right out straight too! First, we want to let you know that we have been making, making, making! Our inventory is up over 300 ties! We have introduced many new ties and recently added an array of flannels to the website. In addition, we have created a handful of premium bow ties utilizing two complimentary fabrics in each tie. We want everyone to feel included in this Bowline Co. family and we have worked hard to have something for everyone and every day. Wait, weird, that’s our company philosophy! Second, we are thrilled to tell you we are transitioning to a dry goods brand in order to offer a wider variety of wicked nice products to you. This month, we gave you a peek at the direction we are going with some initial concepts for our hat line and you all loved ‘em! Which of course means we are making, making, making more! We think you’re going to love this third item- we are currently working on a subscription bow tie option! That’s right, that’s what we said! Just keep an eye out, we are hoping to announce all the details after the first of the year. But, in the meantime, think about how great it would be to receive a fabulous bow tie 4 times a year at a reduced price! We truly appreciate all your support and hope to hear from you and/or see you at one of the above venues! Happy holidays to each of you! And, if you choose to sport a bow tie during the holidays, rest assured you won’t be dribbling on it! When you wear Bowline Co. you’re part of the family. Let us know where your holiday adventures take you, tag us on Instagram @bowline_co! Journal Entry 001: Allow Us To Introduce Ourselves. 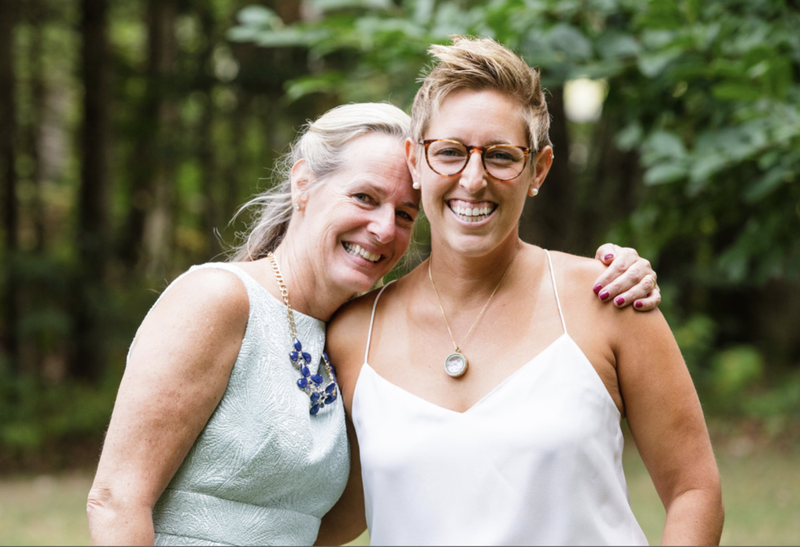 Kellie (left) and Meg (right), the mother/daughter duo now at the helm of Bowline Co.